Radishes at their crisp, refreshing best! The often overlooked radish has been on our table frequently since we joined the Tierra Miguel Farms Community Supported Agriculture program. They are not a food I normally buy, so I’m glad we have been receiving them. That is one major benefit of joining a C.S.A., you get a wider range of produce and therefore nutrients. Radishes contain sulfur-based phytochemicalsis that support liver function, as well as kidney and urinary tract health. They are high in the cancer preventing antioxidant, vitamin C. They are a strong source of potassium, and have a beneficial ratio of Omega 3’s to Omega 6’s (this ration is grossly inverted in the Standard American Diet). My mom used to eat radishes right out of the garden and I thought she was nuts. They had too strong a taste for me to enjoy. For a long time I simply passed on them, until I tried a radish salsa by my friend and fellow chef Andrea Ruhl. I never got her to divulge the recipe, so I have recreated it as best I can. The salsa is simple, fast and easy. Like most salsas it gets better as it sits, but I can’t seem to make enough to have left overs to see how well it keeps. Enjoy! Toss all ingredients well. Let marinate 5 minutes. Toss again and serve. This is great with chips as a refreshing salsa, but my favorite way to eat it is wrapped in chard leaves. 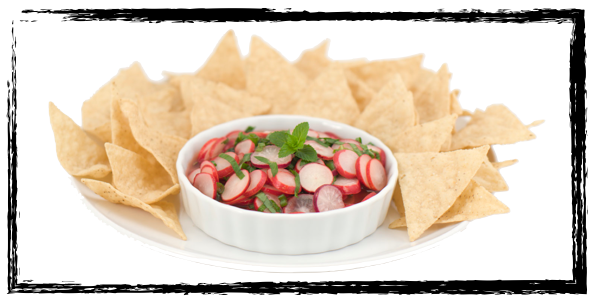 The greens marinate in the juices of the radish mint salsa and soften slightly. It also makes a great quick salad if you toss it with a light lettuce such as green leaf and include some pepitas for protein. YUM! Ready for a two week guided tour of raw cuisine with a chef guided video for every meal?? Take a tour of the Rocking Body Raw Food site. 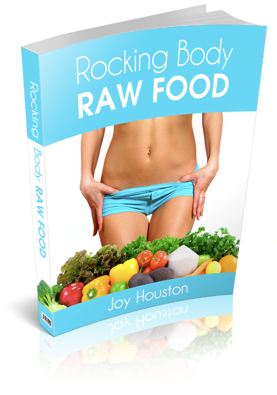 It is a weight loss detox program with Raw Food Chef Joy Houston that includes hundreds of video tutorials, menu plan, shopping lists, and recipes as well as comprehensive training videos and education on the science behind raw food nutrition. If you are ready for a weight loss detox diet that works, tastes great, and involves eating delicious foods and no starvation then this is the weight loss detox for you. What will you look like in your Rocking Body? Joy, this looks so tasty. I just bought some new radish seed called Watermelon radish. planted them today. They are really beautiful, with fuschia colored interior. When are you coming up??? Watermelon Radish is simply gorgeous inside. It works wonderfully well with this recipe, but I haven’t seen them here yet, but we can usually by them at Whole Foods or the Asian markets. Not sure the next time we will be heading North, but we miss you guys, so it needs to be soon!